Navigator Pro 7x30c is rated 4.2 out of 5 by 6. Rated 5 out of 5 by sk47 from You don't know what you've got til its gone. Someone or some thing dislodged the optics in my original pair of 7x30's. I sent them off to Greeley for repairs and they sent me a new pair, no questions. These binocs live by the companionway hatch on my boat and are an elemental part of my port approach planning. 7x30 is perfect for marine use. Stability of image is important, these have it. Constant focus coupled with integral, illuminated (red) bearing compass, easy on the eyes. Lightweight. I can't say enough good about this product. Rated 4 out of 5 by Randy1 from Very nice binoculars I recently purchased these to put on my sport fishing boat. We go offshore and I use them from the tower looking for fish. The ever focus is great for quick view of the water or other boats. I tried to use some 10x50 hunting binoculars but they are way to powerful to try to view anything from a boat rocking on the ocean. After reading several reviews I decided on these. Very nice. Rated 5 out of 5 by Spurgy from Navigator 7x30 Binos I bought these Glasses a week ago for boating! I am very impressed how clear they are across water sharp images Ana accurate compass! Nice to know a company can stick to producing consistent quality! Hope I never need the service but will see! 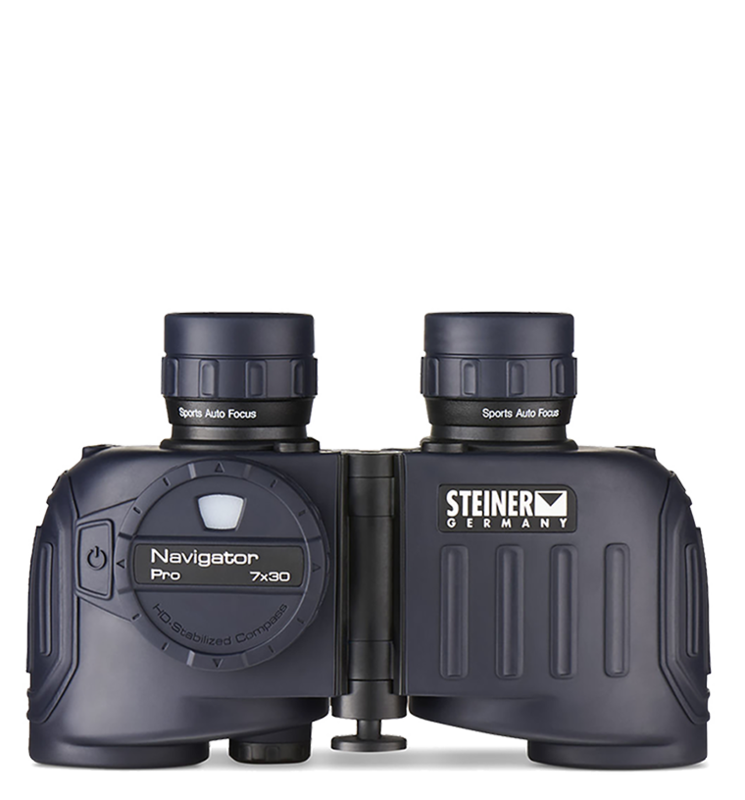 Rated 5 out of 5 by DaveF100 from Very clear optics This is my fourth pair of Steiner Binoculars. First one was bought in 1979 and is still going strong (military marine 7x50.) The design can't be beat, eliminating the need to focus depending on distance. This is my first pair with the compass. It is very useful and is well lit by ambient light and the battery powered illuminator. These 7x30s are very small and fit in a large pocket. Images are extremely clear and these have very good light gathering properties in low light conditions. Rated 5 out of 5 by Papa from I have been looking for a good, not too bulky binocular for boating. I stumbled across the navigator pro last month and decided they were the perfect fit. I am pleased with the purchase I made. Rated 1 out of 5 by MynameisPaul from 7X30C compass bearing does not focus. Due to courier restrictions, I could not import the bino's in South Africa. My girlfriend purchased them in the UK and brought them out. The problem I have is that the compass bearing is blurred when viewed on the horizon. Only when, I tilt the bino's upward, does the compass come into focus??? I have a pair of navigator pro 7x30 binoculars with the floating strap. &nbsp;I purchased a harness that does not have the click-loc system. &nbsp;Is there an accessory I can buy that will allow me to attach a different type of harness? I am looking for the pair that has the range finder reticle, a few pages state that this model has the reticle, but it is not mentioned and Amazon reviews state that it only has the compass reticle and not the range one too. Is this correct? This model does not contain a ranging reticle. You will want to look at the M830r for a model with out a compass or the M750rc for reticle and compass. Does this model have range reticle? This model does not have a reticle. Some questions about the&nbsp;Navigator Pro 7x30c Z2: 1) Does it float? Or do I need the floatable strap? 2) How sturdy is the ClicLoc system? The little pin that locks the strap in its locker just sticks out half a millimeter. It looks so fragile. The binoculars are waterproof to 16ft, but do not float. The floating strap is buoyant enough to support the binoculars. the Clicloc system has been in use for many years, and we've continued to utilize it for its quick-release characteristics and sturdy hold. I have just purchased these. How do I work out ranging distance? You would need a reticle or a range finder. The Navigator Pro does not have a ranging reticle. I would like to use my Binoculars in the shooting range. can they be mounted on a tripod, for hands free use?